Our large variety of equipment is state-of-the-art. 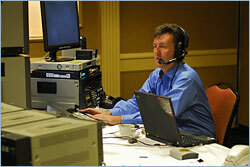 Each piece is tested prior to every event, and we bring back-up equipment for any unforeseen circumstances. We take pride in our ability to offer the best technology available.